I think there is bug in your server. Every other broadband test gives me the result of 10Mbps of download this is the only website which shows 2.3Mbps for 10Mbps...I would agree if it was somewhere near. But, where is 10Mbps? where is 2.3Mbps? There is something wrong in your website mate. The reason why all the other tests are showing you the same is because nearly all of the testing sites run the same software. That runs on flash which isn't the best protocol for testing your connection through the browser. Ookla tests and other flash speed tests can adjust your speed by up to 40% to offset for an unknown variable. If the variable isn't know... how can you offset for it. No matter what, they're guessing at best. TestMy is the only test of its kind in existence. And has been in development for nearly 10 years longer than Oolka (speedtest.net and nearly all other tests online). There could be a lot of reasons this can happen. Bad peering (routing), bad cable modem, MTU could be set wrong... TestMy's results has even been known to reflect issues with hard drives. I encourage you to browse and post in my forum. Read some of the hundreds of posts where people had the same scenario as you, something that other tests missed.... sure enough, they almost always find an issue. I would love to know why your speedtest is so inconsistent on my connection. I have 100/100M service and regularly test at speedtest.net. Your test understates my upload and download speeds significantly. Joe Barnhart, President of PAXIO Inc.
My tests use raw form submission upload through your browser. Other tests that go through flash may be by passing any bad settings in your browser that may be slowing you down. TestMy.net is unique in its method but employs the same type of uploading process as if you were uploading a video to youtube (for instance). If you're speeds are suffering significantly you may want to look deeper. I also offer testing to Washington, DC and Seattle, WA. Testing to these locations will show you if you may have any routing issues. If your scores are much higher to the any of the other mirrors then you most likely have a routing issue that's effecting your traffic to Dallas, TX. ...that's a place you want to have a good route to. ALLOT of the servers in the US are hosted in TX... this is why I picked that as my home server location. ... certain types of symmetrical business class internet won't max out unless you thread (or run multiple) uploads or downloads. Check with your provider on that. ... then again, aren't you your own provider? I've been told that speedtest.net as well as other flash speed tests multi-thread. I don't. I don't try to do anything extra to 'squeeze' out higher numbers. I call it how I see it. speedtest.net (ookla) is the most popular speed test online. But they are far from accurate. Please read >> https://testmy.net/ip...m-speedtestnet/ and related posts to see what I'm saying. They pretty much admit themselves that they have a flawed methodology, I show proof of that. On top of that stuff, they test users on servers so close to them... they eliminate the internet route. Isn't that information you NEED to know? You be the judge. ... Note this, my tests had been in development already for nearly a decade before speedtest.net was even though of. That domain had been purchased in 1999 but speedtest.net as you know it launched in '05. The CEO of speakeasy left came into this game with a budget and a pretty flash interface. Don't be fooled. Many speculate that they are in the pockets of the ISPs so they doctored their method to make them look better. Knowing that the owner was the CEO of a major ISP, makes me wonder sometimes too. ... but I try to stay in my own yard. - I hope you like the site, please pass the site along... TestMy.net is word-of-mouth only. PCCW at a data center, and those connections are gig and faster. server? Apache or something custom? Are your servers connected with gig or better? Probably. test that is capable of sustaining the full speed of their service. This is one of the most common questions I get. This is because TestMy.net is a more thorough test of your connection. Many things cause this, here's a topic that may shed some light on the subject. https://testmy.net/ip...m-speedtestnet/ -- I seriously don't know how speedtest.net stays in business, maybe because their site looks awesome... people have been telling me for years that my tests consistently detect issues when speedtest.net says things are fine. I'm hoping that the world gets the word out for me. ... before that site came along, TestMy.net was the standard for many ISPs. 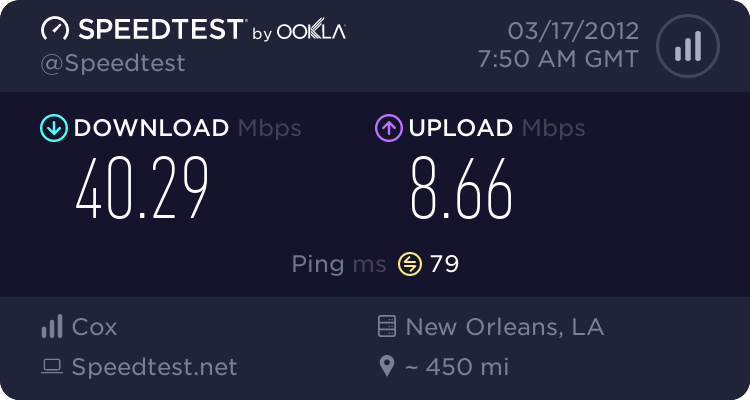 Those tests over at speedtest.net make the ISPs look better... and that's the truth behind why providers have started to tell their customer service reps not to use my site and have started pushing their users to internally hosted speedtest ran by none other than Ookla. Ookla owns speedtest.net and the owner of Ookla was the CEO for Speakeasy before he started that site. Take a second to digest that information... My site, in contrast, stands for the consumer. ISPs contact me all the time wanting me to run my software on their servers. ... I tell them, that defeats the purpose. - Cheers, thanks for visiting and please tell your friends... I grow by word-of-mouth only. P.S. I hope you find your issue... check MTU and RWIN (receive buffer)... if your on a cable modem, check your modem. Most often I find that people will swap that out and the problem is solved. Speedtest.net doesn't seem to notice bad modems... haha, seriously... time and time again. The numbers they report are doctored, simple as that. ... I also think they multi-thread the test which can make you look better than you really are. Sure, you may be able to open a bunch of slow connections and they add up to a faster connection... but if my site says otherwise you most likely have a problem. Trust me, my test was in development nearly a decade before speedtest.net even hit the scene -- when you find your problem can you please post something under this topic >> https://testmy.net/ip...m-speedtestnet/ it may help someone in the future. While trying to fix my internet speeds with Suddenlink, I was using Testmy.net to gauge how much my up and down load speeds were. I was getting some really bad number (5.9M DN and 49k UP). Talking to the tech at Suddenlink he advised that I use speedtest.net. So checking at my office the different results between TestMy, Speakeasy and Speedtest site I came up with 4.6M DN and 4.1M UP with Testmy.net but I got 15.84M DN and 8.40M UP with Speedtest.net and 9.97M DN and 8.45M UP with Speakeasy.net. Why is there such a big difference between the two. And I know that it is not the Flash GUI causing the difference, as you guys were HALF what they other guys are telling me. Please help me understand why your test is running so slow? Speedtest.net and Speakeasy.net are setup to favor the ISP IMO. When you're testing your internet service the last person you should be asking is your provider. What do you think they're going to tell you? They want to cut down on service calls. On TestMy.net you should first test using all three servers, East Coast, West Coast and Central... if you get bad results to all three then trust me... your internet service is being effected. TestMy's servers are not located within your hosts network, as they would often times like you to test from. I host my servers where the majority of popular websites host their servers. ... if you don't trust my unbiased opinion then go test on Speakeasy or Speedtest. But trust me when I tell you... I'm the only true speed test that works for the consumer. All the others are either owned by ISPs or are having their pockets padded by the ISPs. Here's a little fact, speedtest.net is ran by the former CEO of Speakeasy! Do you think they're going to design a test to benefit their ISP cronies or the consumer? TestMy.net on the other hand stands nothing to benefit from misrepresenting the numbers. I've also been testing consumer internet for much longer than they have. My methods have been proven effective since the dawn of the internet speed test. If you're not pulling your speed or close to it from my servers... you've got some issue along the route. I bet you can feel it too... otherwise you wouldn't be out trying to test it. It's up to you who you trust. If you take their word for it... it's like trusting a used car salesman to tell you how mechanically sound a car he's trying to sell you is. Sorry, but I'll get a second opinion. I hope you like my website, ...a lot of ISPs don't. I'm just telling everyone the truth. Sometimes the truth hurts I guess. I have been having problems with broadband linespeed and have been running tests on your site as well as BT Speedtester. Is there any particular reason tests here would be constantly below BT e.g. test 3 min ago 10.00 on here and 14.73 on BT. First, sorry this email is so long. Sometimes I don't realize how much I've written until I'm done. I can't really speak for other speed tests out there but I can share some information I've gathered about some other so called Internet speed tests. This information may pertain to BT's speed test as well. >> https://testmy.net/ip...la-speed-tests/ -- there are related articles linked at the bottom of the first post of that topic that may also shed some light on the subject. My speed test has many things going for it that lend to it's accuracy. TestMy.net has been around since 2001... I have more experience than anybody when it comes to Internet speed testing. It started as a hobby and as a tool I built for myself but for the past 8-9 years I've been completely dedicated to TestMy.net. I've actually been developing my tests since 1999 but in the early years I had to shut down for a while because it cost me too much to host the site. Back before 2001 there really wasn't sufficient Internet ad revenue to offset my bandwidth costs. It grew too fast, too quick and too early in the history of the Internet. I had to shut it down until the cost of bandwidth decreased and ad revenue possibilities increased but I never stopped developing it. I even had sponsors that promised me bandwidth only to shut me down when they realized that I wasn't exaggerating with my bandwidth projections. It was pretty frustrating times. Thank god for Google Adsense and my other sponsors... also the cost of bandwidth is more than 100X less than it was. TestMy.net does not host within any providers networks, my host directly peers with many providers but my servers are not on the edge of their networks. All providers are graded based on the same criteria, everyone is given a fair chance to score well. If the provider is weakly peered or has issues with their routing then it will be more apparent using TMN. Providers would like you to test within their networks because when you do you eliminate variables that could make them look bad. These variables that may or may not be in their control. But I feel that's the information you were looking for. If you want to test your Internet speed then you have to test it through the Internet, using a normal routing procedure as if you were visiting any other website. Don't you agree? I provide a real world scenario not a best case scenario. Overstocked and overpowered... my servers are more powerful than what is needed for my application... WAY overpowered. I have multiple gigabit symmetrical uplinks to one of the most powerful, well connected hosts in the business, hosted on major Internet pipelines. My main server is smack dab on top of the heart of the Internet crossroads, right on an artery where a larger percentage of the worlds popular websites are hosted. Any provider worth anything should peer well to that location. Distance is not always a factor. Some other sites lead you to believe that you need to test off a server near you. It's a complete fallacy. Okay, let me ask you this, when you visit a website... how often do you get to pick where it's being served from? Sometimes they ask you location on International sites but that's usually more for a language preference. How often is that being served even from the same state that you're in? Trust me, not very often. I have seen people on the other side of the planet pull 200+ Mbps from TMN. A properly configured like on a well connected provider can max out or nearly max out over thousands of miles. I offer east coast and west coast servers only as a comparison to the main server to help diagnose routing issues. I could easily set it up so that people are sent automatically to the closest server but I feel that isn't always an accurate representation of your connection. I personally live over 1400 miles from my home server, I'm able to max my 50Mbps line with no problem... as long as my home connection is working the way it's supposed to. That's a few reasons why other speed tests out there may report differently. There are more reasons, TMN is unique and proprietary in how it operates. BT as well as just about every provider on the planet USED to send their customers to TMN to test their connections. I've had a lot of call center techs send me copies of training manuals from back in the day where it was standard procedure to test at TestMy.net. It was seriously step one in many cases. What I think happened is they realized that they could cut down on service calls and save money by showing customers that their connection is working fine to THEIR servers. They then blame any problems on the website that the customer is visiting. The problem with that is that the provider is at least partially responsible for the route you take from your computer to the server you're visiting. They choose who they peer through and sometimes these connections going out to the Internet that they have can be overloaded. If the test that you're using bypasses the route that your provider takes to get you outside their network then you won't see those issues. ... how can that be a test. They also have inferior testing technology. I've been developing my speed test over many years, lots of trial and error and the way I see it... I'll never finish this project. Providers who host their own speed tests have stake in the results... if they are misrepresented the company stands to possibly gain something. .... I on the other hand grade everyone the same. I have no ties to any ISP and have no reason to inflate results. If people suspected that I was misrepresenting the information it would hurt my business. The big ISPs could care less about the traffic to their speed tests... the larger companies stand to easily save millions in service calls and call center support if people think that it's the fault of the website they're trying to visit. ... see what I'm laying down? I've been trying to spread the word about these practices for years. But it's very hard. First, I have to get people to read what I've written. Then I have to convince them that I'm an authority on the subject. It's really hard because I seriously have nearly every Internet provider out to get me right now. I'm telling their customers the truth that they don't want them to know. I've had A LOT of providers contact me wanting me to host my test within their networks, often offering me money and hosting to make it happen. But I feel that I'm working in the interest of the consumer... how can it be in the interest of the consumer if the test isn't really testing the Internet? Hopefully with help from the community I can get the truth out. I truly feel that they're doing it on purpose in many cases and it makes me sick. Consumers are being blatantly lied to. All I can do is keep programming and writing for what I think is right and hope that people visit and tell their friends. If you like what I've built, please pass it along... TMN is 100% word-of-mouth. Many thanks for the reply. Lot of useful info so gives me something to read. Using your speedtest has shown I have a speed of approx 110Mbps. It has been consistently at this level for many weeks. Suddenly it shows a speed of 30Mbps or less. This has been happening for a couple of days. I have switched everything on and off again etc. Other speedtests still show speeds of 100Mbps+. None show as low as your test. What is going on? I use your speedtest because I think it is probably the most reliable. But at the moment I am not so sure. I'm testing normally... everything looks good on my end. When there are issues... my email lights up with user and server generated emails. Looking at https://testmy.net/live and filtering only the server you're using (GB) and I see many people recently posting faster speed. You could have specific routing issues. Also, some issues are more apparent in TestMy.net's results versus other speed tests out there. The most popular speed tests out there aren't giving you a full picture. They combine threads and ignore parts of the result. They are made to benefit the ISP. You can try https://testmy.net/mirror to try other servers or https://testmy.net/multithread to multithread the test. I would also try a different browser. Looks like you used Chrome 67 last, I love Chrome (and that's almost the latest version) but you could still have a problem with it. Try testing with Firefox and see if there's any difference. If there is a big difference, I would go into Chrome settings and reset the browser to default. I've seen bad cable modems show degraded speed on TestMy.net and show normal full speed on other speed tests. This is a very old topic but it's still true today. Same story, different day. Trust the results. My test and servers are the same as always. Thank you for your reply with the suggestions. I am working through them as and when I have a few minutes. So far I have tried Firefox. No change at ~30Mbps. I tried the multithread option but I could not get it to work. It downloaded to 100% and then just sat there; I will try again. I have tried your mirror option - same result as before. I have downloaded TCP Optimizer but I am not sure how to use it yet. Ookla still shows 100+Mbps speeds. All a bit puzzling. I do not feel confident yet to complain to my ISP because they (Virgin Media) will just point to Ookla (as that is the speedtest they recommend). Until I have something more concrete it is difficult to argue with them. What started me looking at this was I was seeing "Waiting for secure connection" messages and some DNS issues ("Site unreachable"). Plus Chrome not displaying web pages until I actually clicked on the tab. It was all a bit slow. I uninstalled some Kaspersky Secure Connection software that seemed to have snuck onto my PC uninvited. I am not sure how much that helped. (I use Kaspersky anti-virus). My browsing experience feels a bit jumpy and jerky but I cannot pin it on the speed issue yet. OK, progress. I used the "if you are in a hurry" options on TCPoptimizer, rebooted and my speed was back to normal. (Or apparently so!). Excellent! Thanks for the suggestion. In fact it was the highest speed I have recorded I think. All is much faster and smoother. I do not know what TCPoptimizer changed. I may go back and investigate if I can unearth what it did. Also I do not know what changed the configuration for the worse, assuming that is what happened at some point. Also I cannot really explain why Ookla (and others) show a "faster" speed. But it is now definitely faster and smoother to use. Make sure you spread the word. You saw TestMy.net totally in action. Most people have no idea that there is such a difference in internet speed tests. Heck, I had to be told at first by my users because I don't look at what the other speed tests are doing. I don't fully understand all the reasons why TMN seems to detect issues when others tests don't. It just does. In my opinion, after witnessing what you did... it's a wonder why more people don't use TestMy.net. But they don't. The topic is from the previous beta, those members carry over to the new beta when it's announced. Probably in the next two weeks. As I said, trust the results.